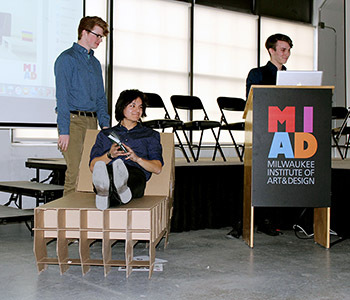 From chaise lounges to children’s chairs, six teams of Industrial Design (ID) students create functional seating designs using donated Dura-Fibre laminated paperboards. Students in Senior Professor of ID Pascal Malassigné’s, FIDSA, Human Factors and Ergonomics course brought their concepts to life in a presentation for Dura-Fibre representatives, who generously donated the paperboards used in the project. Each team brought the finished product to the presentation, explaining their ideas from preliminary sketches to the final design. “We worked with MIAD on a design project and could not have been more impressed. What the students were able to accomplish in five weeks, without factory-sized machines, was absolutely incredible. The design project was outside of our internal expertise and working with MIAD allowed us to accomplish things in five weeks that would have taken us months, possibly even years, to do internally,” said Luke Benrud, President, Dura-Fibre. One design, the Sine Seat, has room for two, providing a seating arrangement that encourages face-to-face conversation. 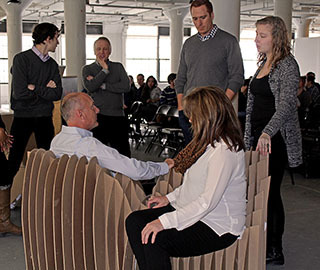 Another team crafted a seat that is made up of three distinct, and moveable, parts. the paperboards, and no glue or fasteners were permitted. Each unique piece demonstrated how the product can be utilized in new and inventive ways, illustrating the power of design.